If you would like more information about the modernist techniques, ingredients, and equipment used in the sous vide spicy turkey breast recipe with avocado salad you can check out the following. Mix together the spices in a bowl. Salt and pepper the turkey then sprinkle with the spices. Place in the sous vide bag and seal. Place the sous vide bags in the water bath and cook for 2 to 4 hours. For more information on the cooking times you can read my detailed article which addresses why is there a range in sous vide cooking times. Combine the lemon juice and garlic in a bowl, add some salt and pepper and let sit for a few minutes. Slowly whisk in the olive oil until the mixture thickens. Remove the turkey breasts from the water bath and pat dry. Sear the breasts over high heat until just browned, about 1 to 2 minutes per side. Remove from the heat and cut into strips. Place the arugula in a serving bowl and add enough vinaigrette to flavor it, tossing to mix. 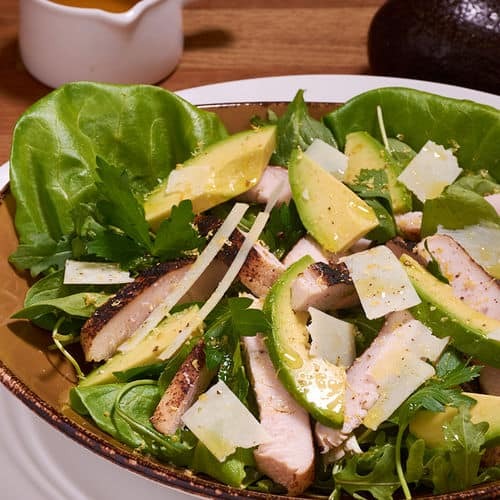 Top the arugula with the avocado slices and turkey. Spoon a bit more dressing over them and season with salt and pepper. Using a vegetable peeler, shave strips of Parmesan cheese over the top then serve. I really enjoy turkey spiced with chipotle powder combined with this avocado and arugula salad. It kicks up the heat and zippy flavor without overpowering the blander turkey.